T. ANDREW DEANERY — The White House staffers who open President Barrack Obama’s mail are likely well aware of Tommy Behan’s pro-life stance. Behan, a member of St. Maximilian Kolbe Parish and a sophomore at Lakota East High School, has written the president every day since Obama’s inauguration asking him to change his position on abortion. 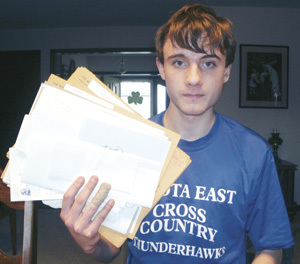 The 16-year-old has handwritten and mailed more than 430 letters. The teen usually writes in the evenings. He avoids email, preferring to show his passion with the extra effort a handwritten letter requires. His parents supply the pens, paper and stamps. If Behan gets pressed for time and misses a day, he’ll write additional letters until he is caught up. The letters are sometimes mailed in batches. Behan begins each letter by telling Obama how many times he has written before. Then the teen argues the constitutionality of abortion, talks about justice for the unborn and tells of the lives that have been lost. His stance is straightforward: Life begins at conception and comes before liberty, he said. One of six children, Behan has seen his sister and her husband suffer miscarriages. That experience has made him more passionate and given him more resolve to try to get Obama to publicly change his position. After about three months of writing Behan received a form letter from the White House. There have been about 17 more since. The generic replies thank him for writing and sometimes acknowledge the topic. The teen also debated the issue in an editorial in Spark, a well-known student magazine at Lakota East. She said her son is dedicated to the letter-writing campaign and is self-motivated.Go to Catholic Telegraph here to read the rest. Bravo Mr. Behan! This entry was posted on Friday, April 16th, 2010 at 8:24pm and is filed under Uncategorized. You can follow any responses to this entry through the RSS 2.0 feed. Both comments and pings are currently closed. What an inspiring young man! I know he’s rather young and might be lacking a few professional credentials – but can’t we get him on the Supreme Court? 😉 He’s got more common sense, at least on this issue, than many judges do! Good for young Mr Behan. Truly inspiring. He’s missed on Mr Obama being the most radical pro-choicer–two presidents surpass him. I’ve got the young man on the hook for $1285.68, but it’s money well spent. Which ones? If you think Nixon was one, you’re sadly mistaken — no matter what Nixon may have privately thought about abortion, he did not take ANY executive action to promote or facilitate it. He was “personally in favor, but.” Same for Ford and Carter. And don’t trot out Reagan’s approval of legalized abortion while he was governor of California; by the time he became president he’d changed his tune. Clinton was the only president who even came close. First let me send out an admiring “Well Done!” to the young man. That said, can we stop playing the nice game with people who detest the unborn, particularly of minority and low income birth, with a passion and ugliness to which the name “pro-choice” cannot do justice? If the only acceptable choice to these people is the death of the unwanted unborn, can we just call them baby killers? The left has pre-approved this moniker (dating back to its use against US military returning from the Vietnam War) so there should be no official moratorium declared on its use while the PC committee determines acceptability. Yep, that seems to me much more accurate. Perhaps not. Killing involves a deliberate act of will and responsibility. There is a difference between having a false belief that one should not prevent the killing of another human being, even a baby, even if allowed by law. Among recent presidents, both Bushes, Mr Nixon, and Mr Johnson would fall into the category of more radical “baby-killer” because of their execution of war. Though legal, and in some cases justified by followers, still resulted in the killing of babies and others. By the expanded definition, I’d say that Mr Obama comes in at least in fifth place, going back to the Vietnam Era. But by the stricter definition of abortion, yes, I’d say that Mr Obama comes in third behind Mr Clinton (for his slightly quicker enactment of executive policy) and Mr Nixon (for his SCOTUS). Number three may try harder in the view of some, but it doesn’t raise the money quite as ably. There is a sort of charming devotion to how Todd shows up to make these specious arguments every single time Obama’s pro-abortion fanaticism is mentioned. I’m willing to concede neither earnest nor charm. At least in the case of Hitler the mentioned assertion has the virtue of defensibility. As for earnesty and charm — I don’t think I can get my tongue any further into cheek without choking. I don’t know that it’s charming as much as it pokes at Republicans and political pro-lifers, as it was intended to do. Make a real case, guys, without alluding to foreign dictators. I know you can do it. Really, what’s the point? All the usual monikers–the worst, the best, the great–these are all the hackneyed expressions of cheerleaders trying to drum up support. In the case of the GOP and the political pro-life movement, monetary support. Especially during a recession. And especially after their political butts have been whooped. I’m amused y’all brought up Hitler. Usually you accuse libruls of that. You also mentioned the numbers game, but didn’t mention the presidential administration during which the most US abortions took place. Are we talking millions or are we just talking pieces of paper? Getting back to the point, most activists, liberal or conservative, want us to believe we live in some exceptional age. I dissent from that view. It is a mark of hubris (or more likely opportunism) to suggest we live in a key moment for something or other. The odds are that key moment passed or is in the future. As for abortion, the floodgate were opened by a largely GOP-appointed SCOTUS. After which, it was going to be difficult to generate the means to curb or ban abortions, except by persuasion. Fast forward to 2009-2010, and we have FOCA very DOA, a presidential policy delayed to avoid a certain Clintonian clumsiness, and lots of other behavior that strikes many Americans as moderate on abortions. What I would be willing to grant is that Mr Obama might elicit the most bitter feelings among pro-lifers, and they interpret their inner churning as bad. It’s more logical to swallow a Tums. Maybe avoid hard drinking and spicy food, too. I admire Mr Behan for his persistence and expression of good citizenship. Likely that Mr Hitler and Mr Nixon would view it less favorably. That the lad considers a certain relativism among US presidents, well, he is only 13. How many have we had since he was conceived? I suppose the interesting question is, why exactly do you think that it’s so important to “poke” at Republicans and at pro-lifers, Todd? I think the reason why you generally get a reaction is that the “Obama isn’t really the most pro-abortion politician in history — just very, very pro-abortion” is generally rolled out, not by people who see the need for sober fairness, but rather by people attempting to make the case that political party should be a matter of near indifference for those who oppose abortion — or perhaps even that leaning Democrat is better. In reality, there’s a reason why those who care seriously about the abortion issue tend almost universally to vote for Republicans or third party candidates in presidential elections. The undeniable fact is that, while the GOP is certainly not ideal, the Democratic party has, in the years since Roe, given itself overly nearly entirely to cheerleading for abortion. Back at the time of Roe, this certainly did not need to be the case. Then, both parties had elite that were in favor of abortion and a broadly eugenic agenda, while both parties’ rank-and-file were broadly pro-life. In some ways, the Democratic party might have been a more natural choice to become the pro-life party, given it’s history political machines run by ethnic Catholics. However, it was not to be. Moral, cultural and sexual revolution all found their homes within the Democratic party, while traditionalism built a home for itself in the GOP. That a certain brand of Catholic progressive spends so much time denying that this dynamic exists far more revelatory than elaborate quibbles as to whether Clinton might somehow have been marginally more bad than Obama in regards to abortion or the other way round. I have a feeling that Nixon gets in trouble b/c he said what the modern Democrats are thinking: eugenics and an utter distaste for the poor motivated the Democrats to jeopardize healthcare reform in favor of abortion funding. Between Obama’s actions in the healthcare debate and his unrepentant votes in the Illinois legislature to protect infanticide I really don’t think this is a serious debate. And even if it is, it’s an academic one at best. Obama is certainly one of the most pro-abortion politicians of his time, even among his party, and his extent of support is something that to be considered when deciding whether to vote/support him. It’s quite irrelevant if he’s better than Nixon if he’s also substantially worse than everyone else on the ballot. To make sure errors don’t get repeated without an alternate view. And I would pretty much reject your position that I stand with those who would want to soften the nature of abortion in the modern world. The fact is that Mr Obama has not participated in performing an abortion, or (as far as we know) asisting a woman in getting one. People who actually perform abortions, or who take advantage of women in crisis to maximize their profiteering or their ideology are far worse than the president. Mr Obama doesn’t get off as blameless in being a political bystander. But pro-lifers insistent on using him as a rallying point strike me as more concerned about making points and raking in donations than making distinctions that might lead to a further reduction in abortions. It takes such contortions of reason and history to claim that Obama is not the most pro-abortion president in history (though it’s true that Clinton is a fairly close second), it’s rather hard to imagine that one would do it for any other reason than to actively carry water for him. So true. Just like Bush never personally shot or bombed an Iraqi and never personally outsourced a job or sold a mortgage backed security. I’m sure you would consider these devastating arguments to your opposition to him if I had used them against you two years ago. This is basically an argument for political indifference. After all, come to that Obama has done virtually nothing positive himself that millions of other Americans haven’t done. Why should one support him as president at all, if it’s only his personal actions that matter and not his positions on important political and moral issues. Not at all. Y’all have conceded it’s close with Mr Clinton, but there were fewer abortions during his presidency than Mr Reagan’s. I say the floodgates opened under Mr Nixon. Abortion rates have slowly dropped since Mr Reagan, but certainly not significantly, and definitely not because of the White House occupant. That’s because you hang out with too many political partisans. I’m doing it to needle you and Donald, and I’m effective at it. Mr Bush was the commander-in-chief, the top of a chain of command that killed people in an unjust war. Mr Obama is a guilty bystander, but most of the people getting abortions in the US are doing so by personal initiative, not because parents, husbands, doctors, clinic personnel, or politicians are telling them to. No. An indifferent person would not praise young Mr Behan. What I would argue is to be indifferent to the Republican Party. That’s a sin in your book, but not mine. I’m doing it to needle you and Donald, and I’m effective at it. So you basically admit you’re just a troll who is just hanging out in a comment box of a blog whose viewpoint you disagree with to stir up controversy and pester people. Wow, some life you must have there. There was a point, 3-5 years ago, when although we didn’t see eye to eye on a lot of liturgical and political issues, you could be an interesting and gracious person to discuss topics with. I’m sorry to see how completely this has changed. Just ban him. He’s carrying water for the abortionists. “Get thee behind me, Satan!” A person who nuances the slaughter of innocent babies is someone that I’m pretty sure Jesus would want out of his way. It looks to me like we’re having a discussion. Things were a bit simpler in those days, though no less contentious. We have this blog, which is fairly political. And there’s a certain vehemence coming from the Right these days. I think we had it to some degree, but its certainly become more intense in the past two years. Like then, I still note that some folks tend to focus on the person rather than the discussion when the latter isn’t going their way. I may have had my disagreements with presidential policy 3-5 years ago, but I certainly didn’t bring Hitler and Mao into the chat. You can believe what you like about other people, Darwin, but from my perspective you’ve changed, especially since you’ve begun contributing to this blog. Getting back to the point, I’d still like to know the significance of a “most pro-abortion president” when abortion numbers and rates continue to decline. Fewer people are choosing to abort and y’all act as if the US is turning into China. I’ve always thought political pro-lifers took themselves a little too seriously, but seriously: some people need a vacation. So, the efforts of pro-lifers to “raise the consiousness” (that phrase is for you, Todd) of Americans on the evil of abortion finally pays off in terms of fewer abortions, and this is proof that Obama isn’t all that pro-abortion. Now that is funny. Aside from the fact that our president lied through his teeth when and as he accused pro-lifers of lying, the notion that one would be so pro-abort as to be willing to deny infants born alive during an abortion procedure ordinary care is just plain evil and such evil is not mitigated just because the infant will die anyway. Abortion rates and numbers are declining? Wonderful. Tell me, what, exactly, has Obama done to specifically combat abortion rates and numbers?? What has he done to cause fewer people to abort? He’s done nothing and you know it. The numbers, if true, are outside of his influence. Why is the rate and number of people going to NASCAR races declining? Obama? Who the heck knows? Why is the rate and number of people eating at McDonalds declining? Obama? Why’s the rate and number of people flying instead of driving decreasing? Obama? The fact that the man is the President has nothing to do with larger, socio-economic decisions that even the authors of Freakanomics can’t understand. Joe Schmoe and Jane Schmoe deciding one day to not eat at McDonalds, or not get that abortion, have nothing to do with Obama. I can’t believe this is your argument. It is pathetic. You’re not doing the best to carry water for the abortionists – and yes, that’s what you’re doing. Because Obama is ideologically committed to abortion, and he’s done nothing definitive to stop it or slow it and is only being swept up in broader social trends. Maybe the Catholic Church and other organization’s message against abortion is slowing the rate and number, notwithstanding Obama’s extreme support of it. Maybe if Obama were actually to DO something instead of just sit there on abortion, the message of those organizations would be hampered and abortion rates and numbers would rise. Maybe every time he takes money from Planned Parenthood, another person says, “Gee, I support Obama and he’s taking money from them – guess I’ll get an abortion.” You don’t know what his effect is anymore than I do. If he were speaking in favor of it or against it, there’s no way of knowing. And this is notwithstanding his major support of it. Stop carrying water for an ideological supporter of abortion. Instead of claiming that mere rates are going down and pretending that those numbers means you don’t have to win the hearts and minds of decisionmakers like Obama, why don’t you do your best to convince those decisionmakers to change their mind on abortion? Oh, because that would upset your broader support of their lefty visions and agenda. Can’t have that. So what if those decisionmakers don’t change their minds, and abortion continues in this country? There’s a lefty agenda to enact! Can’t let abortion get in the way, then. That’s what I’ve been saying. I don’t think his blog gets enough readers. So he comes over here for fun. President Obama doesn’t work as an ob/gyn; he works as an executive. He doesn’t get extra points for not performing abortions. As with the poor woman in the Temple, we can only understand the value of his action by considering his station in life. He has never done anything as president to prevent abortions, and has done everything possible as president to promote abortions. If some human being has done more, even if a previous president has done more, it doesn’t change the consistency with which he has promoted abortion through the judiciary, health care system, and foreign aid. Thanks for making my point. The president is pretty much irrelevant to abortion. Even if he is the “most,” and I think you have yet to make your case for it, it matters as much as him being the best basketball-playing president. Your words, Mike. Not mine. I said Mr Obama is a guilty bystander on the issue. I said he’s not the worst. I make him to be about 3rd worst. I like your definition of “troll,” by the way. The only difference between me dogging you, and Tito & Donald dogging me is that this is their blog. A question of relativism. Are you bothered that someone contradicts your occasionally weakling arguments? The money must really have slowed to a trickle for the GOP. We have FOCA and socialism and all sorts of boogeyman stories. If the pro-life base is a bunch of seven-year-olds, I can imagine it must be scary. As it is, this stance is laughable. Why would a sensible person listen to any of it? I like your definition of “troll,” by the way. The only difference between me dogging you, and Tito & Donald dogging me is that this is their blog. Really? You’re really going to make the argument that a person commenting on their own blog is a troll? Do you even have a life? Paul, among other people, you have managed to turn a thread about a tenacious and faith-filled young man into a discussion about me, my life, and my spare time. My contribution here was simple enough: praise Mr Behan and nudge his one error. Todd, you have wasted a huge amount of energy in this thread attempting to obfuscate the very simple fact that the fight against abortion ranks not at all on your list of priorities, as demonstrated by your support for Obama, the most pro-abortion president in our nation’s history. I assume that your forays onto blogs run by pro-lifers are a futile attempt to salve your conscience. Abortion is the great moral struggle of our time, and in that fight you have enlisted under the banner of those who believe it is perfectly acceptable to destroy human life in the womb for any reason that the mother of the child pleases. Chatter away endlessly in the comboxes of this blog, drag as many red herrings as you please, be as condescending and ill-mannered as you like, your failure as a Catholic and as a decent human being to fight against this manifest evil will not change one iota by your useless attempts to justify your stance in the eyes of others. Donald, stop trolling your blog. Do you see where your “nudges” get you? Why do you do it? Is it an irrepressible urge, or is there some rationality to it? Todd, how convenient to not respond to my link proving that Obama is by far the most pro-aboartion president we have ever had. Too tough for you? Hardly. One instance of a revised bill slipping past the state senator’s scrutiny in 2003 is hardly evidence Mr Obama is the “most.” The link provides objections the man offered in 2001 and 2002, but there is no public record of his objection in 2003. I give it as much credibility as Mr Nixon’s tendency toward eugenics. Which is to say, very little. I think a case might be made Mr Obama was concerned about a back door restriction on abortion. We know he’s pro-choice. There’s no debate about that. The case might be made that he’s as pro-choice of a state senator as others who took a similar stance on the bills in question. The bill may also have had legislative flaws. I think you pin too much on three votes, a year without a comment, and a presidential candidate’s aggressive but unfounded counterattack. But it might also be argued the distinction is one of his actions as a state legislator and his actions as president. It has already been conceded here that the president is of minimal importance. That works both ways for Mr Obama, admittedly. He can delay Mexico City like Mr Clinton did not, and it doesn’t make a difference at all. No, I think Mr Obama is not most, but third-worst. He’s behind Mr Clinton on timing and that he was able to put executive weight behind insurance reform that will both save lives and reduce abortions in the long term. I have to put Mr Nixon at the top. Like many Catholic school students, I wrote letters in 1973, and my recollection (confirmed by present-day reading) is that the GOP was largely behind the early push for legal abortion in the US. Mr Nixon had four picks on the SCOTUS and they went 3-1 for the Roe v Wade decision. Blackmun, a GOP pick, has even been criticized by pro-choicers for the press to overreach past legislation and is cited as the strongest (and most erring) voice for giving us today’s situation: abortion decided by judiciary rather than legislation. As for the rest of you, your tenacious uniformity is admirable. I never come here with a realistic hope of convincing the Republican base. There are people here who just read these threads and come to their own opinion of all of us. You AC bloggers have hijacked your own thread, getting personal about me in response to my criticisms of your arguments. If anyone is still out there, they can review this whole thread and see what is here to be seen: a caution not to vary from the particulars of the abortion sideshow. It’s very much like the pro-choice sites I lurk: lots of emotion–as I would expect from the fringes. Not much hope of changing minds. One can’t both assert that the president’s office is irrelevent to the abortion issue, and at the same time sieze on Nixon’s alleged prescience and some minor timing differences between Clinton and Obama (wow, Obama waiting one day longer before issuing executive orders supportive of abortion) to claim that Obama is not the committed pro-abortion partisan to Obama himself claims to be. Nor is concern with Obama and FOCA merely a GOP fundraising tactic, unless one imagines the USCCB (which has done a fair share of worrying about both, and opposed the health care bill because of its abortion-supporting language) to be an organ of the GOP. That said — Todd’s behavior here has clearly sunk to troll levels, and so I would advise people to follow the standard internet advice: don’t feed the troll. Who cares whether Obama is the most or third or even seventh?! What are YOU doing to try and change our president’s mind?! What are YOU doing to try and help save babies from death by abortion? This is Tom Behan. All I was saying is that I write to Obama because he is the most radical pro-choice President in MY lifetime. I am not old enough to remember Clinton or Bush sr. Take it easy, I was just talking about my personal experiences…No need for nudging here.